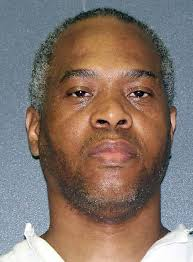 Carl Henry Blue was executed by the state of Texas on February 21, 2013. Carl was pronounced dead at 6:56 pm CDT, inside the execution chamber at the Walls Unit of the Huntsville State Penitentiary in Huntsville, Texas. Carl was 48 years of age. Carl was executed for the murder of 38-year-old Carmen Richards-Sanders on August 19, 1994, insider of her College Station apartment. Carl doused Carmen with gasoline and lit her on fire. Carmen died 19 days later. A second person in the apartment, Larence Williams, was also doused in gasoline. He survived his injuries. Carl turned himself into the police, saying the incident was a prank. Carl did not have a prior prison record. Before his arrest, Carl worked as a laborer. Please pray for peace and healing for the family of Carmen Richards-Sanders. Please pray for peace and healing for Larence Williams and his family. Please pray for the family of Carl Blue.